Our Lincoln was born June 2017 in Alberta, Canada. He was born full term with a genetic condition called Trisomy 9p24.3p13.1. This means that the top (p) portion of his 9th chromosome is duplicated. The easiest way I describe this to others is that it presents similarly to Down Syndrome (Trisomy 21) because the portion of the 9th chromosome which is duplicated is comparable in size to the duplication of the 21st chromosome in Down Syndrome. Trisomy 9p is very rare and my understanding is that there are around 150 people living with this condition worldwide. Thanks to Facebook we have been able to connect with many of these families and get a better understanding of what we are facing, as Lincoln grows. Prior to Lincoln’s birth we had a very eventful pregnancy, which led us to his diagnosis. At 14 weeks pregnant I woke up bleeding and we were sure we were losing the Baby (we lost our first Baby, Jericho, at 19.5 weeks due to a genetic deletion and our third Baby in an early miscarriage). Even the Doctor at the ER was preparing us for the worst and was visibly shocked when he found a heartbeat on the portable ultrasound. We discovered that I had a hematoma on my placenta and I was placed on modified bedrest until my 20 week ultrasound. At that ultrasound they determined that the hematoma was healed and I was allowed to go back to normal life. I had my next appointment with my Doctor at 22 weeks and she told me that they found something called “echogenic kidneys”. It was difficult to know whether this was a sign of anything to worry about. 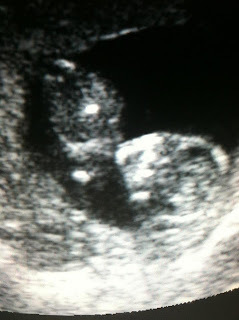 We had to wait a few more weeks and then had another ultrasound on Valentine’s Day to determine if the issue had resolved itself. We went for pizza with our daughter Azalea and somehow the call from the Doctor didn’t come through to my phone at the restaurant. The doctor left a message saying that they wanted me to come in first thing the next day, before the office opened, to discuss the ultrasound. Of course, I called right back but the office was closed for the day so we had to wait and wonder for the rest of the day. The next morning we met with our Doctor and she said she wanted to send us to the Women’s hospital, 5 hours away for a more detailed ultrasound. We travelled to the Women’s hospital and had the detailed ultrasound at 26 weeks pregnant and they had a TV on the wall where we were able to watch the entire scan. Our older daughter’s gender had been a surprise and up until this point we didn’t know this Baby’s gender. The tech asked if we knew and we decided to find out Baby’s gender. It was a boy (Josh later told me that he had accidentally seen that it was a boy so I was glad we decided to have them tell us). The neonatologist told us that he wasn’t extremely concerned but that they would have us come back at the end of the month to see how things were progressing. We made an appointment, which happened to land on our 4th anniversary and headed back to the hotel. We were pretty excited and wrapping our mind around having a boy this time. Our next trip came and we left Azalea with my sister in law so that we could make it a nice anniversary celebration trip too. We went to the Women’s hospital again and as we were waiting a wave of dread came over me. What if something was wrong? We had the ultrasound and a different neonatologist asked us to come meet with her in a board room. She sat us down and explained that she suspected Trisomy 13 (the prognosis for Trisomy 13 is pretty grim and we were told that we may not get much, if any time with our baby). Baby’s brain had a larger chamber than expected, they suspected “rocker bottom” feet, they hadn’t seen his hands unclenched in any previous scans, and the kidneys were still enlarged and “bright”. She gave us the option to wait and see or to have an amniocentesis done (a needle placed into by belly to remove some fluid for genetic testing). We opted for the amniocentesis because I was 30 weeks pregnant and the risk was preterm labour, not miscarriage, at that stage. We returned to our hotel and just cried and cried for the rest of our anniversary. We weren’t ready or able to face the possibility of losing another Baby. After an excruciating weekend we received a call that Baby did not have Trisomy 13. The genetic counsellor chuckled as I audibly sighed with relief that Trisomy 13 (as well as 18 and 21) was ruled out. In passing she mentioned that they still had a bit more testing to do. Approximately a week later we received another call that further testing had come back and that our Baby had a chromosomal change and that they wanted us to return for another appointment to receive the details. At 33 weeks pregnant we were told that our son has Trisomy 9p and that he would likely experience developmental delays, learning difficulties, have a distinctive appearance and have other health issues. Obviously we had no way to know how severely this would affect his life but we were told that he won’t likely ever be able to live on his own. The geneticist presented our options and one of the options was to terminate the pregnancy. We had to stop her mid sentence because we could not fathom choosing to end the life of our Baby, especially after the pain of losing two other Babies, just because of the unknown. We continued on, waiting for the arrival of our Baby. We returned to the Women’s hospital one more time at 35 weeks for a fetal echocardiogram of his heart and another ultrasound. It was determined that it was safe for me to deliver at the hospital nearest to us (40 minutes away) when the time came. At 39 weeks 5 days I went into labour and an intense 3ish hours later Lincoln was born. I remember his crying face and just saying “he’s so cute”. My Doctor just chuckled at me. I got to hold him for a few minutes and then they took him upstairs to the NICU while I was taken care of and cleaned up. It was determined that he should be sent to the Children’s hospital (5 hours away, in the same city as the Women’s hospital) due to “stridor” sounds in his breathing and because of a suspected hernia in his groin. Lincoln and I were flown down by air ambulance as the sun was rising for the day. The three sleepless days that we spent in the NICU were surreal as they determined that his breathing was okay, that he didn’t have a hernia and that his bilirubin levels were just below the acceptable limit for jaundice. It was an amazing feeling to bring him home and finally have him meet his big sister at 4 days old. At 19 days old Lincoln was admitted to the local hospital for two nights for jaundice. During that hospitalization they did another ultrasound and determined that he did, in fact, have an inguinal hernia (even though the children’s hospital had dismissed it). In August Lincoln and I took an “Angel flight” to the children’s hospital for a pre-op consult. The doctor told us that there would be a 6 week wait to get in for his surgery. Two days later we got the call that his surgery would be 13 days later. We scrambled to make arrangements and Lincoln and I returned for his surgery, days after he turned 3 months old. It was overwhelming, as we waited for them to take him to be operated but I looked into his eyes and there was a reflection of a Rainbow from the light above that was so reassuring to me (both Azalea and Lincoln are our “Rainbow Babies” a Baby born after the loss of a Baby). Lincoln’s surgery went wonderfully and we stayed the night while his oxygen levels stabilized and then we were allowed to return home the next day. Aside from a lingering infection which required two walk in clinic visits for topical and then oral antibiotics, Lincoln’s hernia surgery was successful. A few weeks after his surgery Lincoln had an ultrasound of his heart and we were told that he has a possible Atrial Septal Defect (ASD- hole in the heart). We are hopeful that it will close on its own without surgery. At the start of November Lincoln and I returned to the children’s hospital to meet with the Geneticist who originally gave us his diagnosis. She was absolutely thrilled with how well he is doing and said she was going to nudge the cardiologist (heart) and nephrologist (kidneys) because we hadn’t heard from them. She also sent us for a blood test because he had some petichiae (burst blood vessels) but thankfully that came back clear. Lincoln is growing fairly well, now that we have figured out how to navigate solids, with his reflux (although he is small and has “microcephaly”). He has low muscle tone so he is delayed a bit in reaching some milestones already but he is happy and relatively healthy. At this 6 month mark we have had 8 medical trips, three hospitalizations, averaged two appointments a week and one surgery. We are also up to 17 specialists, doctors and therapists who are setting him up for the best possible early intervention and success. Canadian healthcare is such a blessing and I cannot imagine the medical costs we would have had (even the costs of the trips we have taken have added up very quickly and we’ve only recently been set up with some financial support). He is now 9 months old and we are preparing ourselves for more testing to see how he is doing, as his first birthday approaches. We are so thankful to have this wonderful boy in our lives and we are excited to journey with him and find out who he is going to become. omg he is just to cute!! Prolong pregnancy is really a issue of tension. We faced this sometimes for some causes. Thanks for sharing this nice article regarding this.